This happened few months into my marriage. I was trying to get myself to eat fruits on a regular basis. I even started noting the days I have been eating them. Once during one of the calls home, I was proudly recounting about this newly acquired good eating habit and praising myself in the process. My mom was obviously happy at my "turning a new leaf" when came a silent quip from my "new" husband. "Oh yes! She is indeed eating fruits daily now with utmost diligence. Now, all that's left is for her to expand her definition of fruits to something other than apples and bananas, especially bananas!" Then continued another 20 minutes of conversation - more so laughter at my expense with me sulking in the corner refusing to talk to "unappreciative people!". But it was a revelation for me, myself cos I did not realize that all I had been indeed consuming "regularly" in the name of fruit(s) were bananas with an occasional apple thrown in. Guess you now know the LOVE I have for it. Changes I Made: Needless to say, bananas have never been in my "going-to-spoil-soon" list ever! But that happened recently and I am going to conveniently blame it on the round-the-clock schedule with work and a baby for even forgetting to eat my favorite fruit. Seeing them "I-am-so-ripe-that-I-am-going-to-burst-soon" was nerve racking to say the least. I popped them into the freezer and the first thing I made out of them were these cupcakes. I skipped the eggs from the recipe since I did not have them on hand. Since frozen bananas add additional moisture to the batter, I reasoned that I could afford to cut out some of the moisture (and fat in the process). Hence out went some of the butter since bananas are buttery enough for me :) I had wee bit of walnut oil left in my pantry - exactly 2 tbsp - hence used them up along with vegetable oil which also replaced some of the butter from the recipe. Towards the end of baking, the aroma that wafted from the oven is something to be experienced. 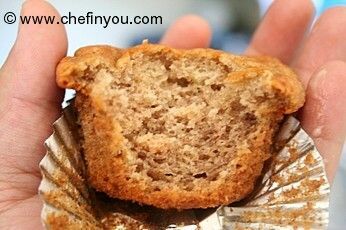 These made moist, chewy, fluffy, light cupcakes that was all about the bananas and nothing else. 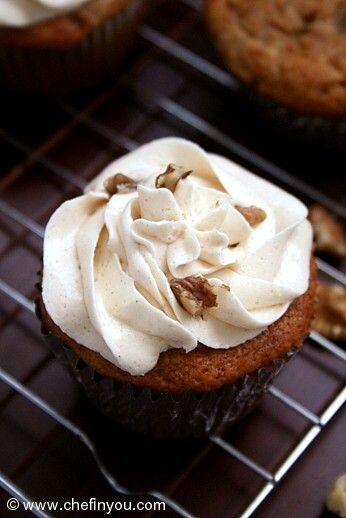 Since I had used a bit of walnut oil, I add few chopped pieces of toasted walnuts to add some nuts in the bargain to my frosting. This turned out to be a favorite recipe for us. 1. If you do not have walnut oil, simply replace it with additional Vegetable oil. 2. If using regular bananas, use additional 1/4 cup of liquid - either by way of butter or oil or any other flavorings you can think of. 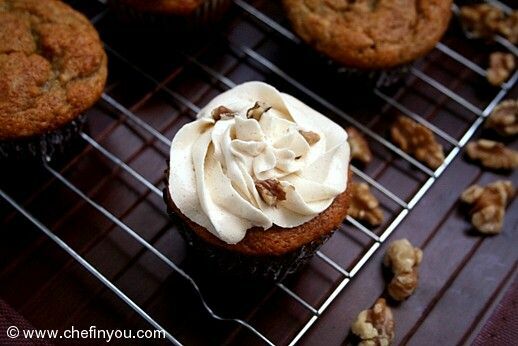 3.The Frosting is not Vegan and is optional to this recipe. But you can probably use Agave or any other sweetener if Honey is not acceptable to you. 1. For the Cupcakes: Preheat oven to 350 degrees. 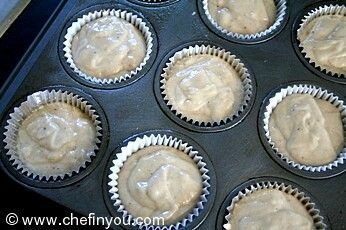 Line a standard 12-cup muffin pan with paper liners. 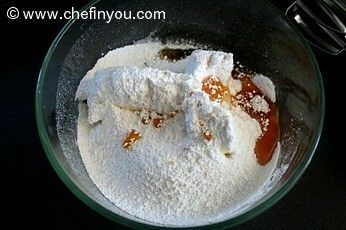 In a bowl, whisk together flour, sugar, baking powder, baking soda, and salt. 2. Thaw the Bananas. I let it sit out for around 20 minutes. 3. Peel the bananas and drop them in your processor. Puree them until smooth. A quick pulse of about 4-5 times should do it. 4. 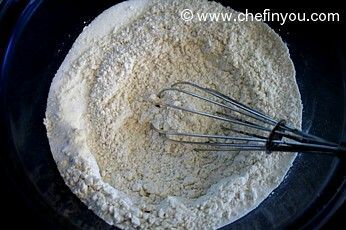 Make a well in center of flour mixture. 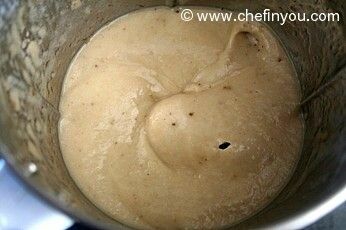 In well, mix together oil, pureed bananas and vanilla. 5. Gently fold the dry with the wet ingredients until combined. 6. 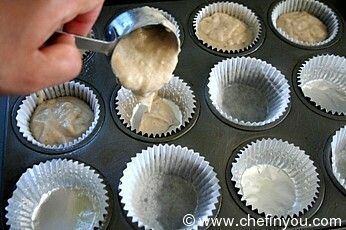 Dividing evenly, spoon batter into muffin cups. 7. I used a 1/4 measuring cup to divide my mixture. 8. 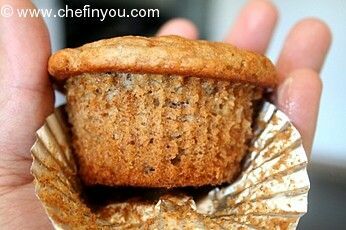 Bake until a toothpick inserted in center of a cupcake comes out clean, 25 to 30 minutes. 9. 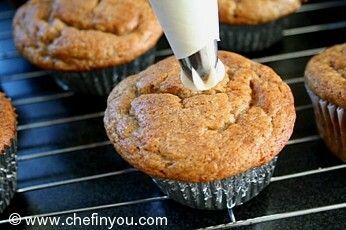 Remove cupcakes from pan; cool completely on a wire rack. 10. For the Frosting: Take all the ingredients for the frosting in a medium bowl. 11. 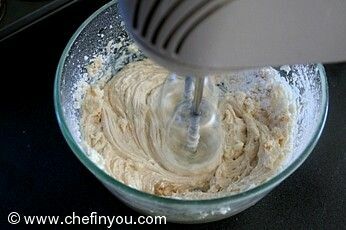 Using an electric mixer, beat it until smooth, 4 to 5 minutes. 12. 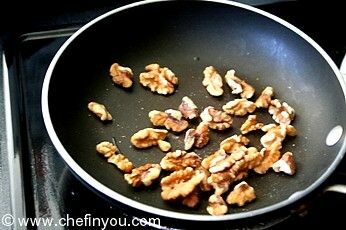 Take the walnuts and dry toast them in a skillet. Chop them coarsely. 13. I used a piping bag to top the cupcakes. 14. But it is optional. You can simply spread them on top of the cupcakes too. Though I personally think that the frosting is optional (also there are no takers for sweet stuff in my house), my colleagues at work loved them with the frosting. It was a massive hit and they insisted that I recommend it for this cupcake :) I sprinkled it lightly with toasted walnuts. 15. 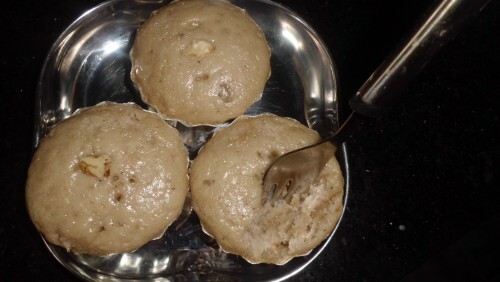 The cupcakes were moist and those who enjoyed it were overjoyed to know that this moist and tender crumbed cake was butterless and low in fat with a total of only 1/4 cup of oil in the (12) cupcakes. 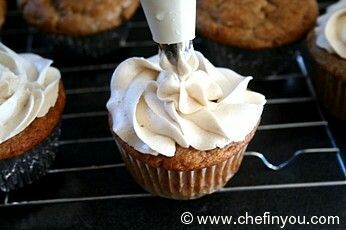 So those wishing to avoid the fat, you can skip the frosting and enjoy them as they are. 16. Can you see the spongy insides? These were fluffy, light and very flavorful. We enjoyed them the day I made them (for evening tea) and for breakfast the next morning after warming them up slightly. It makes a great breakfast too. I made Banana cupcakes today. Thanks for a recipe without butter!. The result was good. I didnt have walnut oil so replaced with vegetable oil. I baked it in my pressure cooker. I do not have oven. But it was very good. Thanks!. 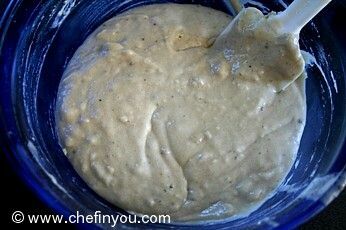 can I add chocolate chips in this batter? hi, 1-1/2 cup flour-does it mean 1&1/2 cup flour ? i just want to be sure. this is a lovely recipe and plan to bake it soon. thanks . i loved this recipe..great for sweet cravings but can i substitute vegetable oil with or groundnut oil? Can i use rice flour my son has an allergy to wheat.... If i can use the rice flour how is it done, this is all new to me. I love cupcakes. Specially when they are baked at home. And this one here is baked using banana which makes it more healthy and nutritious. Thank you so much for sharing this recipe. Perfectly baked. 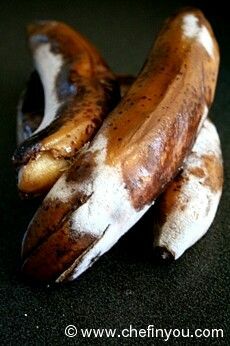 Peel bananas, put into plastic bags and freeze. Use frozen bananas- Put into your blender with some water or milk, to make lovely smoothies, or use extra water for a thinner (milk like) consistency and pour over your breakfast cereal/porridge. (it becomes a pudding - yummy!) Josie. I just tried this recipe yesterday, and it was a big hit with my fruit/vegetable avoiding hubby!! One question though, the cupcake really stuck to the sides of the cupcake wrapper. Am I doing something wrong? 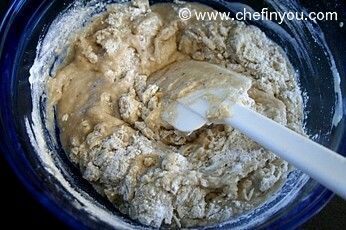 I sifted the dry ingredients, I'm not sure if that impacted the recipe. Hi.. I read your article, and Im just wondering if I can bake this using a microwave oven?. I really want to try it. Thanks..
Made this this morning for breakfast and they came out beautifully delicious!! Followed majority of directions given except I used half Whole wheat flour and half white flour.. 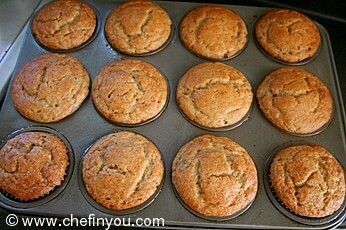 I used 5 fresh bananas (no frozen on hand), half Splenda and half regular sugar (cut the calories) and lastly, for my additional liquid (since my bananas werent frozen) I used about 3 tablespoons of unsweetened applesauce (rather than more oil).. baked on 345 for 25-30 min.. Best healthy banana muffin I've tasted thus far!! I want to make this receipe but I don't know how to prepare it in the microwave with the grill, combine, and convection mode options. I've gone thru the manual which at some times tell to use the grill mode and some times the combine mode, I'm bit confused. Pls. help if you can. thanks/regards. and the nutritional value? cals carbs fat sodioum? Unfortunately this recipe cannot be considered Vegan because of the use of honey. "Veganism is a way of living which excludes all forms of exploitation of, and cruelty to, the animal kingdom, and includes a reverence for life. It applies to the practice of living on the products of the plant kingdom to the exclusion of flesh, fish, fowl, eggs, honey, animal milk and its derivatives, and encourages the use of alternatives for all commodities derived wholly or in part from animals." If you are truly wanting to remain vegan omit the honey. Hi, love your website! Can I use pineapple instead of bananas? Thanks for sharing all your recipes! This recipe turned out great! I had some frozen bananas but it was not enough so I added 2 normal fresh bananas and added some low fat oil to make it equal 2 cups. It's the best eggless recipe I have tried. Thanks for your step by step instructions and tips! could you let me know info. on how many calories per cupcake? Planning to use fresh bananas.. and cant wait. 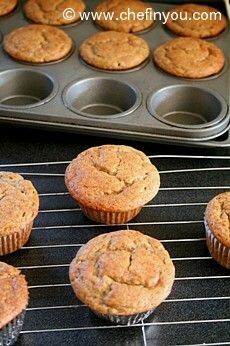 Wanted to clarify tip 2 as its a bit confusing.. ' If using regular bananas, use additional 1/4 cup of liquid - either by way of butter or oil or any other flavorings you can think of.' By 'liquid u mean oil/butter right.. and not the banana puree? Hope it turns out equally good with fresh bananas. I want to make it fresh bananas. Please explain ur tip- 'If using regular bananas, use additional 1/4 cup of liquid - either by way of butter or oil or any other flavorings you can think of.'. Does it mean extra liquid of the pureed banana, or oil? Is oil better to use or butter? And will the cupcakes turn out equally good with fresh bananas? I want to make it with fresh bananas. Can you please explain this tip- :? 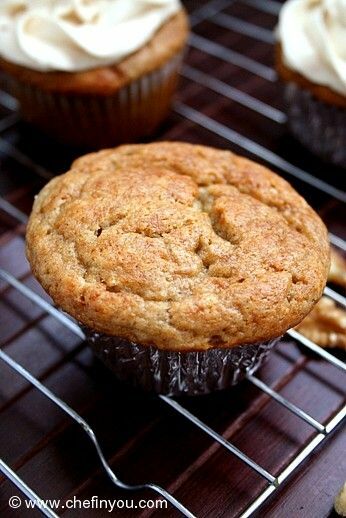 : 'If using regular bananas, use additional 1/4 cup of liquid - either by way of butter or oil or any other flavorings you can think of.'. Does it mean extra liquid of the pureed banana, or oil? Is oil better to use or butter? And will the cupcakes turn out equally good with fresh bananas? hey d.what does thaw mean??? Instead of cup cakes can I make a simple cake using the same instructions ? I dread buying bananas as their shelf life is less than 3-4 days.. atleast in this part of the world they get ripe super quick! Thanks to you for this recipe.. will start buying bananas once again!